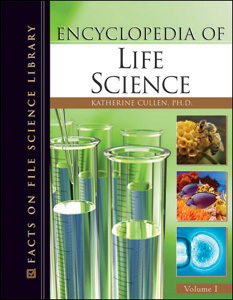 Authored by: Katherine Cullen, Ph.D.
Intended to complement the material typically taught in high school biology and introductory college biology courses, Encyclopedia of Life Science is a two-volume reference set based on the National Science Education Standards. More than 200 comprehensive entries, arranged by topic or theme, cover concepts, theories, sub-disciplines, biographies, common methods, and techniques relevant to modern science. The definitive reference in the area of life science, this accessible full-color resource provides historical perspectives, portrays science as a human endeavor, and gives insight into the process of scientific inquiry by incorporating biographical profiles of people who have contributed significantly to the development of the life sciences. Processes that shape the natural world and life within it are also discussed in this in-depth encyclopedia. Instruments and methodology-related entries focus on the tools and procedures used by scientists to gather information, conduct experiments, and perform analyses. Other entries summarize the major branches and sub-disciplines of life science and describe selected applications of the information and technology gleaned from life science research. "...useful...easy access to information...recommended for high school, college, and public libraries." "...should be included in school and public libraries as a first source for basic information on life science topics. Recommended." "Distinguished by authoritative, accessible content and excellent color graphics, the Encyclopedia of Life Science is highly recommended for high-school, undergraduate college, and public libraries."